Memories of last summer's Transamerica bike trip flashed as we rode into Ashland. A year previous we had stayed in the same hotel riding down the same streets. What brought those memories to the forefront was the fact that duel train tracks run down the center of the main drag!! Leaving town by way of the road parallel to the tracks we headed toward Richmond with the skies blue and the day promising to be warm. For the first ten miles the route had us back out on the country roads with no traffic, plenty of woods and fields, and no wind. As we approached the outskirts of Richmond we came up over a rise and out of the forest to see a field the size of ten football fields. Sitting on a small ridge on the perimeter were cannons aimed across the expanse. Riding a little closer we realized that we were in the middle of the Richmond Battlefield. 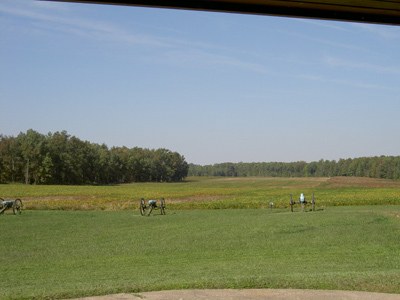 This particular field was the site of the Malvern Hill Offensive. Next to the Battle of Gettysburg, this was the bloodiest and most deadly of all battles during the Civil War. It took place in 1862 and was the last fight in the Seven Days battle. General George B. McClellan's Union army was trying to seek shelter after being maneuvered away from their base at White House Landing just outside Richmond. The Confederate army under the leadership of General Robert E. Lee scaled several assaults only to lose McClellan and his army during the night as their moved southeast and set up camp at Harrison's Landing. The entire Battle at Malvern Hill lasted only a half a day, but cost 8000 men their lives. Richmond today is a thriving beautiful city. In the days of the Civil War, or as the southern like to refer to it, the War of Northern Aggression, it was the capital of the Confederacy. Entering from the north we first passed the stadium where the present day Richmond baseball team plays. Venturing further into the city we found ourselves in old Richmond with it big beautiful mansions. 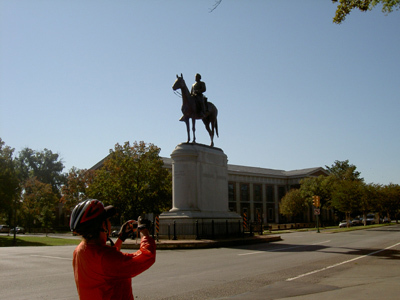 Monument Avenue is the hallmark street of the city. Still brick paved it is a wide boulevard surrounded on both sides with mansions dating back to early times. As the name of the street suggests, there are magnificent statues rising from the center of each rotary every four or five blocks. Each statue symbolized a person of great significance to the Southern Confederacy. Names like Jefferson Davis, Thomas Jefferson, Stonewall Jackson -- all stand proud guarding the avenue. 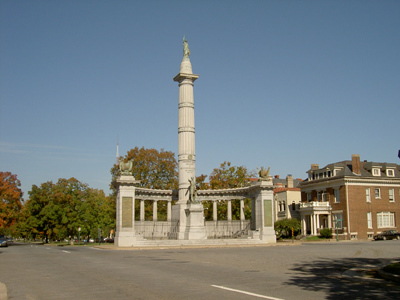 Monument Avenue leads directly into the downtown area of present day Richmond. Our route took us pass the Jefferson Hotel, a stately and dignified residence of visitors to this metropolis. Further on it was the office buildings, stores, restaurants and later the restored warehouses in which tobacco and cotton were once stored and now contain art galleries and shops. Richmond is steeped in history. Once outside the city limits we were once again thrust into the countryside. Within a few miles we were back in farmland complete with pickup trucks and red dirt. For the next ten or so miles we traversed the land on roads called Carters Mill, Longing Bridge, Willis Church reflecting who and what was there years ago. As before each had a number so we were able to determine early on if the road would have traffic, was paved, or even had a line down the middle signifying a two lane road! An afternoon delight surprised us. 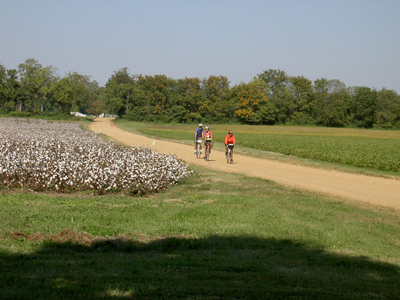 A sign stated that Shirley Plantation was just two miles off route. We decided rapidly, that it was a must to see. Seems that Shirley Plantation sitting proudly on the James River is the oldest plantation in the south built in 1816. It has been owned by the same family for twelve generations. 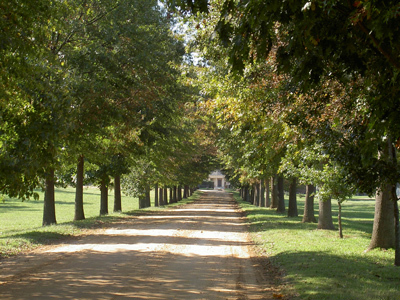 For a complete history of the place, go to www.shirleyplantation.com . We spent a delightful hour and half touring the home and property learning that the present Carter family still lives in the main house on the second and third floors with the tourists roaming around on the first!! Nice way to help pay for the property taxes -- just open your home a little and allow people to enjoy your history for just a small fee. Hopewell was our final destination for the night and was founded in 1613 by Sir Thomas Dale. City Point’s , the oldest home, is located on a bluff overlooking the James and Appomattox Rivers and has been an important factor in Hopewell's history for almost four centuries. 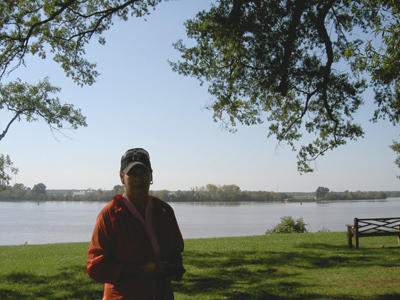 The tiny colonial village of City Point saw the Revolutionary War fought on its banks. Later, in 1864-1865, General Ulysses S. Grant directed the 10-month Siege of Petersburg from the grounds of Appomattox Manor. 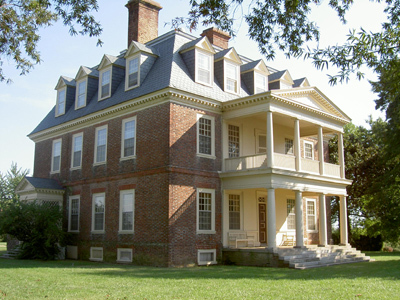 This plantation home is now part of the City Point Unit of Petersburg National Battlefield. 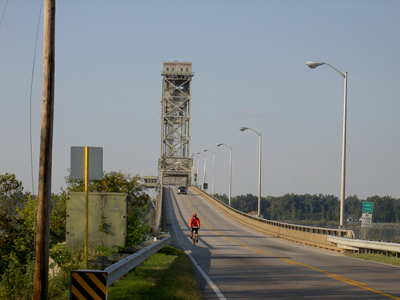 Hopewell was developed by the Dupont Company of Wilmington, Delaware in 1914. 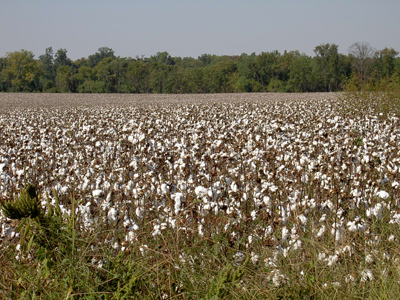 This company first built a dynamite factory and then switched to the manufacture of guncotton during World War I. Although Dupont left Hopewell after the war, many manufacturing giants have since located in the city. These companies have included: Allied Signal, Firestone, Goldschmidt, Hercules/Aqualon, Honeywell and Smurfit-Stone. Products as diverse as the first automatic dishwasher, the first Kraft paper and cardboard boxes, china and artificial silk have been manufactured in Hopewell. We stayed at the Hampton Inn in the middle of the fast food "joints" and car repair dealers!! So much for sitting in the middle of history! !